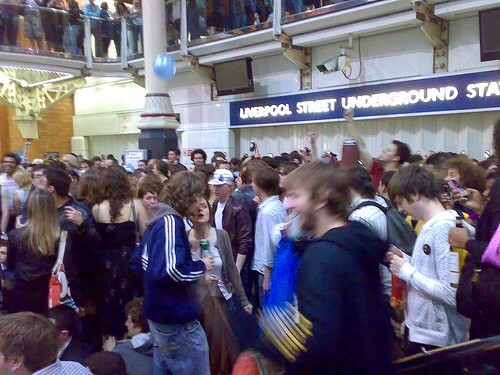 Saturday's "booze ban" party on the London subway is described as chaotic and violent. Transport officials report 50 staff assaulted. In a bid to reduce public binge drinking and the problems associated with public drunkenness, London Mayor Boris Johnson implemented a ban on alcohol in all city public transport, which went into effect yesterday. As a last hurrah of sorts, thousands of Londoners filled the city's tube stations on Saturday night for a public party saying goodbye to a long-time right of passage within the city – drinking on the subway. Video of the party shows a chaotic scene, underlining, in effect, the societal problems that led to the ban on alcohol. Saturday's party brought thousands into the underground, led to the closure of 6 stations, the arrest of 17 and the assault of a reported 50 London Transport staff. Transport Union officials criticized Transport bosses for "crossing their fingers" as the party drew near, and also the police, for what they say was an insufficient reaction to the scale and intensity of the event. Several trains were damaged during the party, including one train damaged after the driver refused to move after someone climbed up onto the roof. The new Mayor's moves to reduce antisocial behaviors have been controversial. Some welcome the inititiatives, like Don Shenker, chief executive of Alcohol Concern who says that public drunkenness just reduces the enjoyment of public spaces for everyone in society. Others, like British comedian Stephen K Amos, find the restrictions controlling, arguing, "This is just the 'nanny state'. Drinking is part of the culture in this country." Surveying the broken glass and damage left in the party's wake, London Transport Union officials said that their staff described the party as "among the most chaotic they have ever seen, with none of the mitigation and crowd-control that would be in place on New Year's Eve." Britons are looking hard at the problems of teen drinking after the death of 22 year old Gary Reinbach from complications related to advanced cirrhosis of the liver. A British charity survey reveals that teenagers with nothing to do are likely to take advantage of low cost alcohol to get drunk over the summer holidays.